Gutter Pro uses the latest technology in cleaning methods. We use a low pressure house wash system that utilizes cleaning agents to remove mold, mildew, and algae from the surface of your home. Soft wash services for roof or tile. Why should you wash your home? Letting mold, mildew, and algae grow on your home not only makes your home look poorly kept, but can actually cause damage to your paint. A regular house wash can help extend the life of the paint on your home. 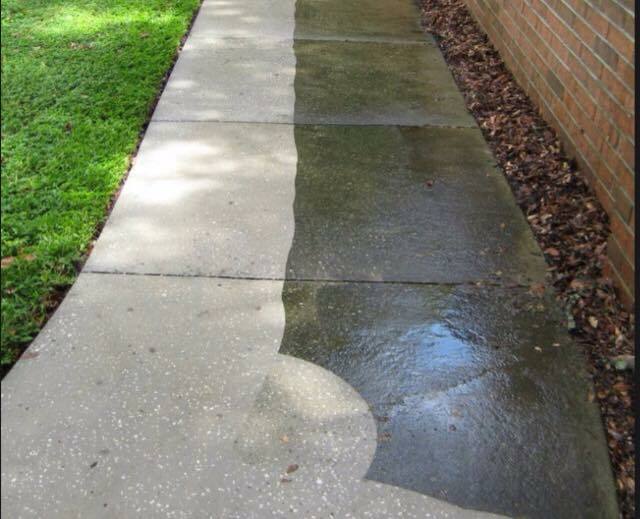 We are a full service pressure washing company. We offer high pressure washing for concrete and brick work, soft wash service for decks, siding, and roofs, as well as custom cleaning solutions for pool decks, awnings, and wood fences and pavilions. We have top of the line equipment that allows us to use cleaning solutions custom tailored for the specific cleaning task. Letting us take care of your pressure and soft wash projects will not only make your home look and feel new, but it will also help to maintain or even increase the value of your home. Whether it is your lifelong home or you are getting ready to sell don’t trust the appearance of your home to amateurs, call us today to see the difference a pro makes. Contact us for a free quote today!